Do you want to Cancel this Application. All of the entered information will be lost. To proceed to the next step, click the "Next" button. At any time, you may return to a previous step by clicking the "Back" button. If you wish to cancel the application at any time, click the "Cancel Application" button at the bottom of the screen. 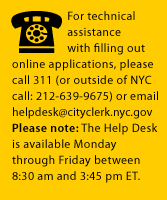 For complete information on obtaining a Marriage License, visit the Marriage Bureau section of the Office of the City Clerk Web site. The Bride/Groom/Spouse A's last name. If there is only one legal name, you may enter it in either the "Surname" or "First Name" fields. "New York State Law permits you to change your last name (surname) as a result of getting married. This law does not permit you to change your first name or middle name through marriage. View the exact language of the Domestic Relations Law of the State of New York. Learn more about name change options. Your surname does not change automatically upon marriage unless you elect to change it. Nothing in the law requires you to change your name when getting married; it is your personal choice. You are not required to have the same surname as your spouse. Option 4: a combination surname separated by a hyphen, provided that each part of such combination surname is the premarriage surname, or any former surname, of each of the spouses. Should you elect to change your surname, the change takes effect immediately upon the completion of your Marriage Ceremony. The use of the name change option will provide you with a record that you elected to change your surname through marriage. Your Marriage Certificate constitutes proof that the use of the new surname or the retention of the former name is lawful. Neither the use of, nor the failure to use, this option of selecting a new surname through the use of the Marriage License application affects your right to adopt a different surname through usage at some future date. New York Law states that you have the right to adopt any name you wish simply by using that name consistently and without intent to defraud." If either you or your prospective spouse is under the age of 18 years, you are required to have written parental consent to obtain a Marriage License and you may not apply for a Marriage License online. Learn more about getting married if you are under the age of 18 years. A New York State Marriage License is valid for 60 days, except for active military personnel, for whom the validity runs for 180 days upon proof of active military duty. If you have an apartment number, please provide it. New York State Law requires the collection of this information. The Bride/Groom/Spouse A's Father/Parent's last name. If there is only one legal name, you may enter it in either the "Surname" or "First Name" fields. The Bride/Groom/Spouse A's father/parent's pre-marriage last name. State only needed if Country selected is United States. The Bride/Groom/Spouse A's Mother/Parent's last name. If there is only one legal name, you may enter it in either the "Surname" or "First Name" fields. The Bride/Groom/Spouse A's mother/parent's pre-marriage last name.